Nixtamalization is soaking the corn kernels in calcium hydroxide for 24 hours. I use colored Indian corn, since I grow it. About three liters of corn mixed with three large tablespoons of calcium powder. I use Mrs. Wages pickling lime. Bring to a boil then turn down the heat and let soak, stir occasionally for 24 hours. The nixtamalized corn is then dehydrated for storage. It is used as one of the grains for my gruel. 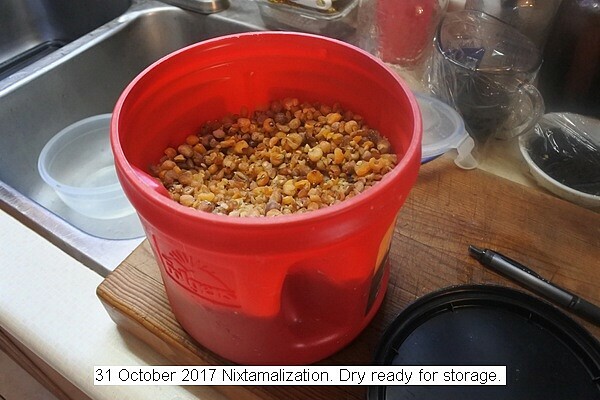 This entry was posted in Uncategorized and tagged 31 October 2017 Nixtamalization Corn, Nixtamalization. Bookmark the permalink.